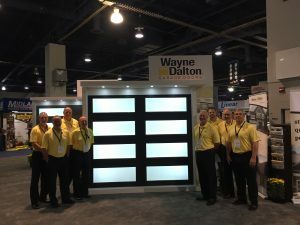 March 15, 2019 – Wayne Dalton, one of the premiere manufacturers of residential and commercial doors in the United States, will be showcasing its latest product offerings at the 2019 International Door Association (IDA) Expo. At Booth #739, attendees will get an exclusive sneak peek at the soon-to-be-released Model 7409 Harrington Carriage House Wood door, to kick off the launch of its new Cape Cod-inspired Bay Collection. Other products to be featured include the recently launched Model 888 ADV-Xtreme high speed doors and Wayne Dalton’s newest color Terra Bronze on the insulated Model 8300. Wayne Dalton is expanding its Carriage House Wood door series with a soon-to-be-released Bay Collection that includes garage door designs that have been inspired by the architecture found throughout the Northeast near Cape Cod. The new collection features three designs— Models 7407 Scarborough, 7408 Berkshire and 7409 Harrington— built with four-layer construction, including a polystyrene core. Inspired by glistening modern skyscrapers, Wayne Dalton’s Model 8450 Luminous® instantly adds sleek style to any residential setting. The full-view glass door features no visible framework from the exterior and includes a flexible vinyl bottom seal to provide a great weather barrier that helps deter dirt and other elements. Model 8450 doors are built-to-order and can be customized in five glass finishes (Opaque White, Opaque Black, Mirrored Gray, Mirrored Bronze and Translucent Black) and five structure finishes (Bronze Anodized, Black Anodized, White Powder Coat, Bronze Powder Coat, and Black Powder Coat). Model 8300 Classic Steel is one of Wayne Dalton’s best-insulated residential garage doors made durable with each section containing two layers of steel surrounding a thick layer of foamed-in-place polyurethane insulation, resulting in an R-Value of 12.12*. Model 8300 is available in five classic and contemporary designs and a wide selection of painted and bi-directional wood grain finishes, including a new color option called Terra Bronze that is a mix between taupe and brown. Model 9700 Carriage House Steel garage doors feature large sections that allow for ample amounts of light when designed with windows. Design and hardware options also include embossed, high tensile steel panels that give off the appearance of wood with the strength of steel. Model 9700 provides a variety of color options, including four paint finishes, three two-tone paint finishes and eight stained finishes for a real-wood look. This door also offers wind load options, pinch-resistant panels and the TorqueMasterⓇ Plus, the company’s exclusive counterbalance system that safely contains springs inside a steel tube. Wayne Dalton’s Model C-24 features Miami-Dade wind load options available to withstand pressure up to +50.0/-56.0 psf. These reinforcements include four-inch horizontal struts in doors over 10’ wide, heavy-duty hardware and impact-rated glazing. This 24-gauge ribbed steel door is available with optional polystyrene insulation and a variety of sizes and configurations. Model 800 HC high cycle rolling service doors offer a cycle life that’s 25 times Wayne Dalton’s standard rolling service door and feature a three-year, 500,000 cycle warranty. Thanks to its springless barrel design, Model 800 HC doors do not require a counterbalance system and can be serviced with universal components for ease of maintenance and less downtime for added dependability. The standard Model 800 HC can withstand up to +20/-20 psf, with additional wind load options available. Ideal for applications that see heavy use, such as auto dealerships, parking garages and manufacturing facilities, Model 888 ADV-Xtreme opens at up to 80″ per second for maximum efficiency and features a springless, helical design that requires minimal interruption for maintenance. Model 888 ADV-X is made of a dual-walled, solid aluminum curtain for security and comes with a fully-assembled curtain that arrives pre-wrapped in headplate and trusses, ready for installation, in addition to a completely hinged guide and pre-wired connection for plug and play accessories. Wayne Dalton’s Model 885 ADV-Xtreme Exterior High Speed High Performance Rubber Door features a low headroom design to fit more applications and is constructed with five layers of nitrile rubber and four layers of polyester weaver that add strength without the weight and can easily withstand harsh environments. Model 885 ADV-Xtreme was designed to be low maintenance and includes features such as breakaway impact detection and push button self-repair, along with plug and play wiring. Model 885 ADV-Xtreme is capable of handling up to ±27 psf and can operate under pressures up to ±5 psf. *Wayne Dalton uses a calculated R-value for our insulated doors.